Do you have water damage due to a leaky or burst pipe? We can help. We take care of all household plumbing leaks across Chicago and the suburbs including dripping faucets, leaking water heaters, frozen burst pipes, and more. It can happen with the first hard freeze, and it can happen when aging pipes fail. Whatever the cause, our experienced technicians know how to fix it. We repair water pipes in basements, behind walls and under sinks. Our teams take care of burst pipes in all types of residential and commercial properties. A malfunctioning sprinkler system floods rooms and spreads water contaminated with sediment and rust. Immediate repair to broken sprinkler pipes reduces the chance of stains setting in carpets and furnishings. We quickly fix sprinkler pipe leaks and follow through with complete water damage cleanup services. You know you need emergency plumbing services when you’re facing a hot water heater busted with water everywhere. We’re on the scene right away to repair the leak, clean up the mess and get your hot water running again. Home and business owners count on us for the best water heater repair in Chicago IL. A leaking AC unit soaks ceilings, seeps into walls and ruins carpets. We clean up water damage due to dripping AC water pipes in attics, leaking pipes on outside units and faulty lines in window units. Our technicians handle AC pipe repairs at the house and your business. We take care of large-scale commercial properties too. Water leaking from the refrigerator damages kitchen floors and more. A slow leak behind the refrigerator creates an ideal environment for unhealthy mold growth. Our water leak repair services include expert refrigerator leak repair, and we also address mold issues. When you notice any signs of a leaking refrigerator, call us right away. A washing machine leak floods the basement or laundry room in just a few minutes. Whether it’s a water valve leak or ruptured hose, you need help as soon as possible. We’re ready for your call. Our washing machine leak repair services fix the problem, and we also clean up the water damage. When a leaking toilet soaks the bathroom floor, water wicks into walls and damages vanity cabinets. Toilet plumbing leaks inside walls cause mold to grow and quickly spread. Our technicians handle all types of toilet repairs from leaky supply lines to plumbing problems. We’re just a quick phone call away from your home or business. You don’t always notice a kitchen sink leak until the damage is done. Moldy smells in the cabinet are a sure sign of kitchen sink leakage. Ruptured kitchen sink pipes turn into a disaster that quickly soaks floors, walls and cabinets. We repair slow leaks under the sink and behind the wall, and we take care of burst kitchen pipe repairs too. HOW DO WE REPAIR WATER PLUMBING LEAKS? 1. Identify and Repair the Source. There are many different signs and symptoms of a burst pipe, and our first priority is to identify and fix the source of your plumbing problem. We first shut off the water main and locate the problem with our advanced water damage technology for direct access to repairs. Our technicians take care of the pipe rupture and seal off leakage. In case of large breaks or complicated pipe replacement, we bring in a certified plumber. We locate and repair broken sprinkler pipes, stop water heater leaks and fix ruptured basement pipes. Our emergency water leak repair services also address and eliminate gas and electrical hazards. 2. Follow up with water extraction. We use heavy-duty extracting equipment to access areas where a water pipe has busted so that we can thoroughly remove standing water. This critical part of the process minimizes mold and bacterial growth in affected materials. 3. Check all other pipes. Often, pipes and plumbing adjacent to the original leak are at risk of failure. We inspect joints, fittings, valves and connections to be sure everything is in good shape. We use special sublimation techniques to eliminate moisture from all hard and soft surfaces and materials. Our industry-proven process completely dries sheetrock, carpets, subflooring, ceilings and furnishings. 5. Restore & Reconstruct Your Property. 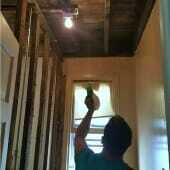 As licensed contractors, we handle all necessary remediation and reconstruction. We coordinate our project schedule so that our tradespeople are on the scene as needed, and we quickly restore your property to its original condition. Do you repair plumbing leaks in any kind of setting? Yes. Our services cover ruptured, leaking and busted water pipes in residential and commercial properties across Chicago, IL and the suburbs. We take care of multi-family buildings, high-rise condos, hotels, restaurants, retail outlets and more. Our technicians handle every type of job regardless of location. Is your broken water pipe repair different from a regular plumber’s services? While we don’t work on water mains or install plumbing systems, we take care of most of the problems plumbers address, and we do more. After burst pipe or frozen pipe repair, a plumber’s job is done. 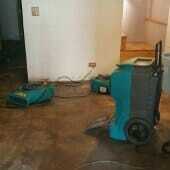 We follow up water leak damage repair with expert cleaning and restoration services that plumbers simply can’t offer. We handle it all: repairs, cleanup, sanitation and reconstruction. 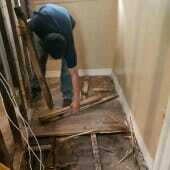 Our teams specialize in restoring property after a flood, and we restore your peace of mind too. Are you always available for emergency water line repair? Yes. We handle emergency plumbing repairs 24/7. If you wake up to a burst frozen pipe in the middle of winter or come home from summer vacation to leaking pipes in the basement, we’re just a phone call away. What do you charge to repair broken pipes? It’s our policy to only give on-site estimates. Once we inspect the problem, we explain the repair work involved and our cost estimate. Be careful of contractors who quote a price over the phone. Can you recommend any helpful resources?